Does your child require a sports physical for the upcoming season? If so, turn to the trusted health care professionals at Vital Urgent Care in the Newport Beach, California, area. Whether your daughter is lacing up her sneakers for the upcoming basketball season, or your son is preparing to try out for the baseball team, our team of Yale-trained and Board Certified physicians has got you and your child covered. We can perform a sports physical for children of all ages and will gladly fill out any and all required forms of paperwork needed to get your child on to the field or court for the next season. 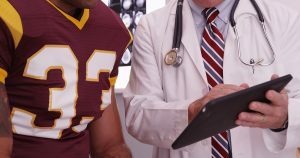 So, when it’s time for the puck to drop or the ball to bounce for your child’s upcoming season, have them receive their sports physical from the respected professionals at Vital Urgent Care. Our experienced team of physicians and dedicated staff is ready to see them. To learn more about receiving a sports physical at our Newport Beach, CA medical facility, contact Vital Urgent Care today.